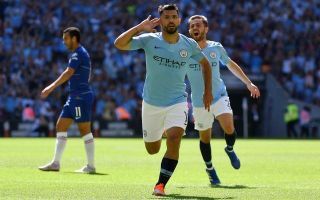 The Premier League’s all-time record goalscorer Alan Shearer believes that Manchester City striker Sergio Aguero is England’s greatest ever foreign import. The Argentina international moved to The Etihad in the summer of 2011 and has since gone on to become one of the greatest strikers to ever play in the Premier League. In over 290 appearances for the Citizens, Aguero has scored an impressive 204 goals, 146 of which have been scored in the league. The 30-year-old striker has earned a sterling reputation as one of the most lethal finishers in European football over the course of his career and has managed to pick up 3 Premier League winners medals during his time in England. Much of his spell with City has been interrupted by consistent injury problems, which makes his scoring record all the more remarkable. Had he been ever present in all of his 7 years at the club who knows how many goals he might have scored by now, as his desire to get into dangerous positions to put the ball into the back of the net has always been so relentless. According to former Newcastle United forward Alan Shearer’s statement on the Premier League’s official website, the Argentine is the best foreigner to ever play in the competition, which he proclaimed whilst picking his team of the week. “He was deadly again,” Shearer said. The pundit referred to the three goals Aguero picked up at the weekend against Huddersfield which took his tally of Premier League hat-tricks to nine. City supporters will hope that their star striker’s scintillating form continues in their next match against newly promoted Wolves on Saturday, where Pep Guardiola’s men will be looking to continue their perfect start to the new season.